Have you ever seen the 1973 French-Italian classic La Grande Bouffe? The plotline is essentially four male friends lock themselves in a suburban house with all the food/wine/prostitutes necessary in order to eat/drink/fornicate themselves to death. Despite its morose, calorific and carnal nature, this celluloid masterpiece sprung to mind during a four-day Parisian trip that redefined the concept of hedonism – minus the suicidal pact and hookers. For sure, the bacchanal set a personal benchmark for libation, but to all intents and purposes, it was a weekend that celebrated friendship, Burgundy and the dying tradition of the “time-spanning restaurant wine list”. Once upon a time there was a noble tradition of restaurants buying wines to cellar for a commensurate number of years in order to offer patrons the opportunity to drink mature fine wines at their plateau of maturity. This tradition now lies on the brink of extinction. Release prices prevent restaurants tying up cash in slowly maturing wines whilst their accountant warns that they will risk bankruptcy if they don’t monetize the inventory by the following tax deadline. When I started in the wine trade in the 1990s, there were still restaurants that boasted thoughtfully curated lists: veritable treasure troves of vintages old and new, the well known and esoteric. Nowadays there are a dwindling number of restaurants that have the means and wherewithal to buy and cellar over the long-term, the two most famous stalwarts are Berns in Florida and La Tour d’Argent in Paris. In January, I visited La Tour d’Argent for the first time with a party of Far Eastern wine-loving friends making their own pilgrimage. They had spent months planning not which galleries to visit or sites to see, but exactly what wines to drink with military precision. Arriving at an ungodly early hour at St. Pancras, I found my fellow Brit lugging a heavy suitcase. It either contained a dead body or multiple bottles of DRC Montrachet. Fortunately, it was the latter. It was going to be that kind of weekend. La Tour d’Argent’s private room in the upper floor had been reserved for not one but three dinners, to the point where I am surprised we did not roll out our sleeping-bags and camp there the entire stay. 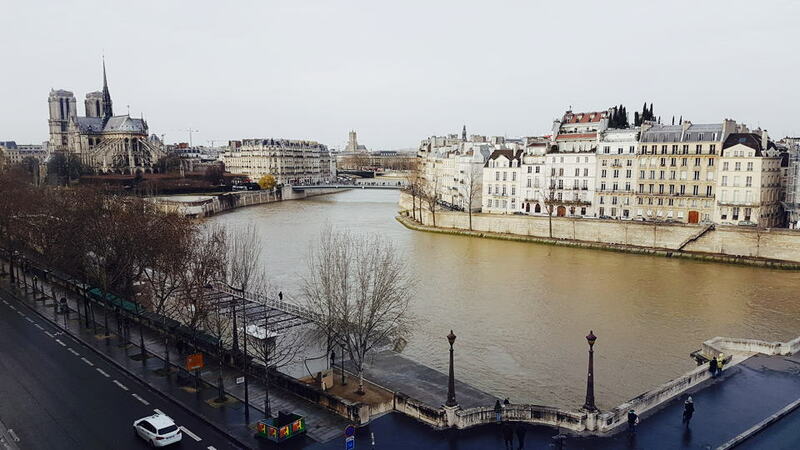 The private room boasts a jaw-dropping, picture postcard vista over the Seine towards Notre Dame, a constant reminder that Paris will always be Europe’s most dazzling of cities. Perhaps there would be more romance had my wife accompanied me instead of a dozen men poring over the minutiae of the wine list, but hey, the romance here was always going to be of the fermented kind. La Tour d’Argent is a restaurant of extremes. It is extremely old, dating back hundreds of years. It is extremely French. The panorama across Paris is extremely beautiful. The food is extremely expensive and given the prestige, to be honest, not the main attraction. However, the wine list is extremely sensational. It is beyond my wildest expectations, so comprehensive that it obliges a leather-bound hardback tome so large and heavy that I am certain it was last used when Gandalf needed to look up a spell. Fact: a sommelier once dropped it and broke his foot. 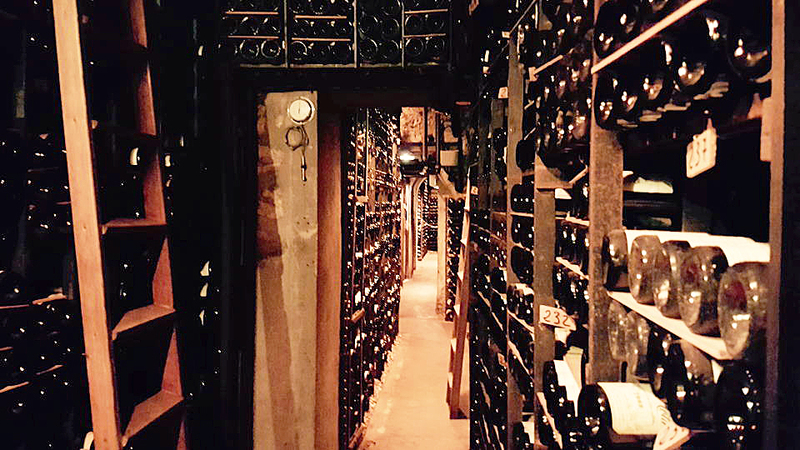 Since time immemorial, La Tour d’Argent has bought wines upon release, buying directly from growers and cellaring until ready in a two-floor basement labyrinth (pictured on the Vinous homepage link). Obviously I have not perused every wine list in the world, but this must be unparalleled, especially apropos the Côte d’Or, page after page of eye-popping verticals from famous names and lesser-seen growers. Two facets of the list take my breath away. First, the reasonable prices if prepared to pay a modest amount of euros and secondly the knowledge that every bottle is of perfect provenance irrespective of age. Surprisingly, the head sommelier is not French, as the name “David Ridgway” implies. David is British and having worked at La Tour d’Argent since 1981, is a fixture of the restaurant as much as the cellar itself. I suspect that he has never been “worked” as much as when our party descended! I heard that David is due to retire next year – difficult shoes to fill. There is little point in describing each wine, but I do recommend reading the tasting notes because you will probably never see such a cluster of legends knowing that all have impeccable provenance. 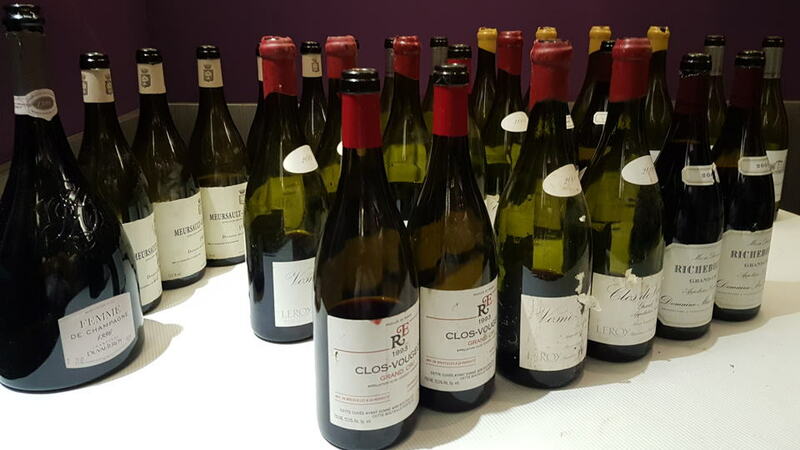 Though undeniably there was a sense of hedonism over the four days, it transpired to be a lesson in mature Burgundy via its most famous growers. Though there were a plethora of winemakers to choose from, when I collated my extensive notes, they focused on a small clutch of Domaines: Coche-Dury, Méo-Camuzet, Leroy/d’Auvenay and Dujac. No Domaine de la Romanée-Conti? Apart from my friend’s bottles of Montrachet, the mark-ups for Aubert de Villaine’s wines were such that they made little financial sense when there were so many relative bargains elsewhere, from Domaines whose wines are more elusive. Case in point, try finding the 1991 Richebourg from Méo-Camuzet and Domaine de la Romanée-Conti and see which takes longer. First Domaine Dujac. The Saturday evening was themed around mature vintages of Dujac with Jeremy Seysses. Please note, Jeremy is not actually on the wine list – you can’t order him along with your Clos de la Roche or Clos Saint-Denis. Together they confirmed that his father Jacques Seysses was a vigneron par excellence, a Burgundy arriviste who established Domaine Dujac as recently as 1969 and immediately began to produce wines that rivaled the very best in the Côte d’Or. It was a remarkable achievement. I am going to pick three bottles that made an indelible impression. The 1972 Bonnes-Mares attested to Jacques’s ability to craft wines with immense longevity in challenging growing seasons. 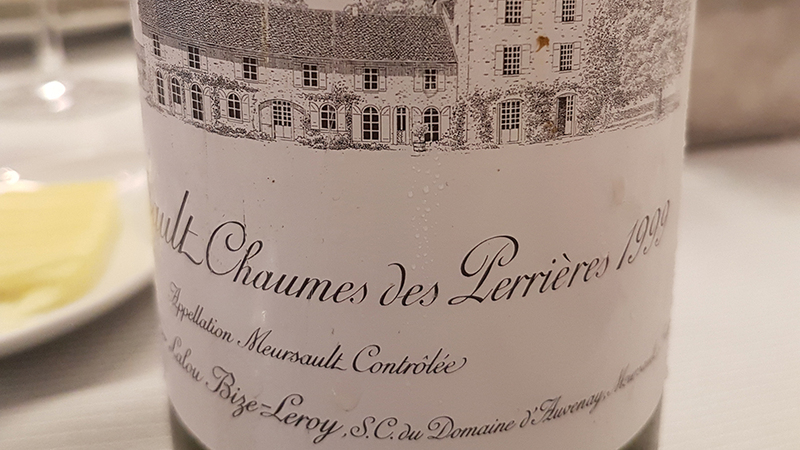 It ranks as one of the finest Bonnes-Mares that I have tasted from that decade: spine-tingling in freshness, a Grand Cru shimmering with profundity almost half-a-century later. 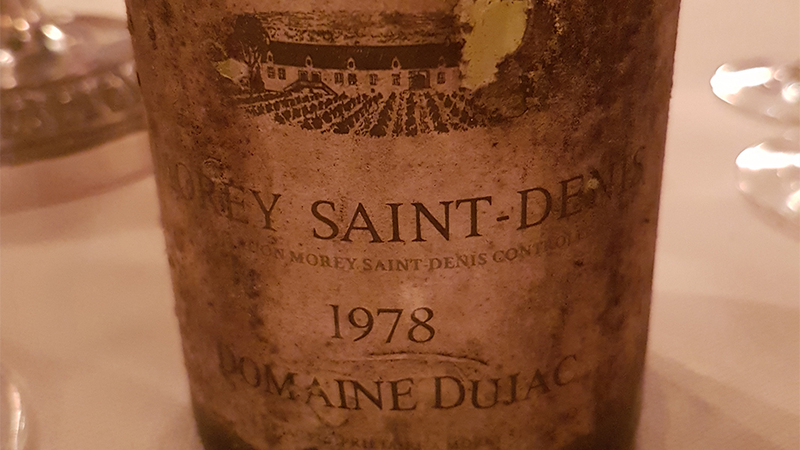 We must discuss the 1978 Morey-Saint-Denis. It is the best village wine that I have ever drunk and is unlikely to be surpassed. This was off the charts. I turned to my neighbor and with barely disguised incredulity asked: “How can this wine be this good?” It made a complete mockery of the Burgundy hierarchy and no, that score is not exaggerated, merely communicates my appreciation for a Grand Cru parading as Pinot more humble. Finally, the 1990 Gevrey-Chambertin Les Combottes. Like the Morey-Saint-Denis, it transcends its status, equal if not better to the Grand Crus that almost hem in this Premier Cru vineyard. At 28-years of age it’s as fresh as a daisy on a dew-dappled March morning and one of the finest 1990 red Burgundies that I have ever drunk. Notably, the 1991 Richebourg. We chose several mature examples from Jean-Nicolas Méo’s domaine but this behemoth slayed the opposition, so good that the following day a second bottle was ordered. Whilst I appreciate the wines of Méo-Camuzet, I have experienced fewer transcendental moments compared to its peers, fewer bottles of irrefutable profundity. But the 1991 Richebourg occupied an entirely different realm: grand and aristocratic, yet graceful and ineffably detailed. Pairing it with Méo-Camuzet’s 1991 Vosne-Romanée Aux Brûlées the gap between the two was more than just Grand and Premier Cru. The Richebourg was not the only dazzling wine from the Domaine. The 1988 Nuits Saint-Georges Les Murgers was riveting. and testament to the peaks this appellation reaches, too often overlooked because it is bereft of a Grand Cru. The 1985 Nuits Saint-Georges Les Vaucrains from Henri Gouges simply reaffirmed that to be the case. The reputation of a winemaker is not judged by what they can create from a propitious Grand Cru but the magic they can produce from a more modest Village Cru. The 2005 Corton-Charlemagne is one of the greatest white Burgundy wines to have passed my lips. I have tasted it four or five times now and it has previously flirted with perfection, but finally I concede – this deserves a perfect score. It is magnificent. Yet it is not the most memorable bottle courtesy of Jean-François Coche that was cracked open. No, it wasn’t the 1992 Meursault Les Perrières, as thrilling as it is. No, it is the humble 1986 Meursault Les Rougeots. This village cru would wipe the floor with many a white Burgundy of higher station: full of tension, poise, freshness, energy and intensity. More than any other, it exemplified the genius of Jean-François Coche and at 32-years of age, you could imagine it lasting another thirty-two. I will not invest too much verbiage because I covered Domaine d’Auvenay earlier this year. Suffice to say that like most people I rarely have the opportunity to taste the wines from d’Auvenay due to their astronomical prices and rarity, but when I do they always make an impression. Both the 1999 and especially the 2005 Puligny-Montachet Les Folatières were astonishing: razor-sharp acidity, a clarity and detail that sets Lalou Bize-Leroy’s whites apart from almost every other producer. However, nobody is infallible. I was rather nonplussed by the 2004 Meursault Goutte d’Or that just lacked the sparkle and vivacity normally found in her wines. We also enjoyed a run of wines from Domaine Leroy, crowned by a pair of spectacular 2000s: Vosne-Romanée Les Beaumonts and Aux Brûlées that made the 2000 Clos de Vougeot look rather ordinary by comparison. This is the enlightening aspect of being privileged with multiple bottles to compare insofar that you see where a winemaker might have truly excelled and where better value might lie (not that I really associate that term with Domaine Leroy these days!). I will leave readers to peruse over 60 wines that were opened during my sojourn to Paris. Keep in mind that I had to depart a day earlier than others. I do not wish to think about the monetary value of these bottles, which lies far beyond my wallet. Day by day, new auction records are being set for blue-chip Burgundy growers, subject to unprecedented hyperinflation. I am extremely fortunate and grateful to be able to taste them. Such fevered demand needs to be counterbalanced by a sober, objective assessment since a bottle of Burgundy that costs thousands of dollars is not necessarily a bottle of Burgundy worth a thousand dollars. There is a salient lesson here: some of the most modest wines were the most memorable. 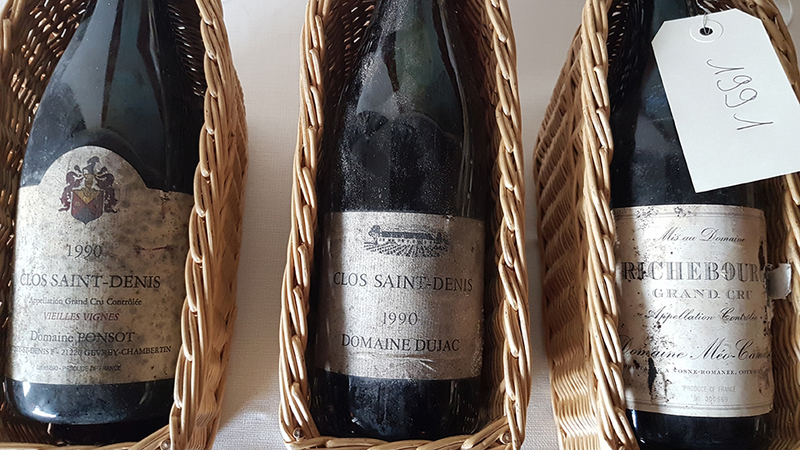 Quality is not hidebound to the Burgundy hierarchy, case in point, the 1986 Meursault Rougeots from Coche-Dury and not least the 1978 Morey-Saint-Denis Village from Dujac. Of course, we did not spend the entire four days at La Tour d’Argent. We visited the Eiffel Tower to buy some plastic key-rings, hiked up the steps at Montmartre, took a boat trip down the Seine and...OK...OK...I’m lying. The rest of the trip was spent at Tin Dinh, Taillevent and Carré des Feuillants, restaurants with wine lists worth looking at, if not quite as otherworldly as La Tour d’Argent. It was not the kind of trip that Alcoholics Anonymous would approve of, but then again, you only get one life, so you might as well drink the best you can. Proving the dominance of Burgundy in the Far East, during the entire time we ordered only one Bordeaux and one Rhône: a rather rusty but intriguing pre-J P Moueix 1934 Trotanoy and a glorious 1981 Château Rayas, despite several tempting and well-priced mature bottles on the list. Before you point it out, the hypocrisy of this article is not lost on me. It’s like people in cars complaining about drivers in a traffic jam. Here am I, lionizing La Tour d’Argent’s cellar whilst not only partaking in its wanton destruction, but advertising the fact and encouraging others to do so. I can only plead guilty as sin. At least La Tour d’Argent continues the practice of buying wines to keep and mature, a constant in the flux of a restless restaurant scene. What has changed is the market, the prices these wines command, the manner in which top Burgundy has been put on a pedestal when truth is that when these wines were purchased on release, they were seen as wines for people who could not afford Bordeaux. One final comment... None of these bottles were prized open within a solemn, reverential atmosphere, dissected and intellectualized, reduced to vinous emblems of wealth. You have to take my word that they were opened and shared with bonhomie, banter and laughter. They were opened in order to learn about the wines and respective winemakers. Opened to be enjoyed and appreciated irrespective of value instead of gathering dust – is that not the raison d’être of wine?